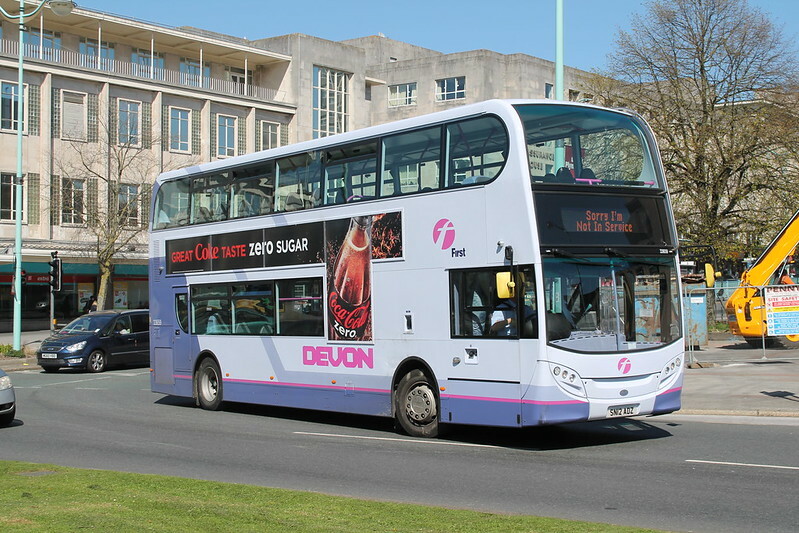 Only the second bus to receive the new DEVON fleetnames is 33659 captured on camera by Richard Smith. Why on earth aren't the buses branded for the Park & Rides? It's not as though they run on other routes. More so, the P&Rs are now commercial, so First should be plugging, plugging, plugging them and then plugging them again. Why is everything First does, so half-hearted? Look up the road to Exeter! Grr. They are not 100% used on Park and Ride, iv'e seen them used on the 6. In times of need anything can turn up on any duty. If this is true I doubt it'll be an entirely new service, perhaps just an extension of the short 42s - City - Mutley - Crownhill - Derriford - Woolwell - Derriford - Crownhill - Mutley - City. Really? Do you have a link for more details on the Berkshire rebrand please? Really? Do you a link for more information on the Berkshire rebrand? There is certainly a new livery being planned for some of the Mercedes Citaros which appears to be a version of the new livery scheme using the older Beeline colours - only seen a very small clip of the front end (drawing). Looks veryt smart - presumably its a route branding rather than a general new fleet livery though. It's being applied to the 10 Citaros being transferred from Slough to Bracknell. As they're needed to work on most of the area's routes it's not specific route branding, but it remains to be seen whether it will be a sort of area branding or will be applied more widely to the rest of the fleet.